Jim Oblon is one of those rare talents—a jaw-dropping guitarist, soulful singer and compelling writer. 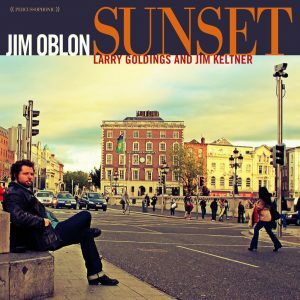 On Sunset, to be released on March 25, Oblon’s virtuosic Telecaster-driven blues chops and vocals shine on a set of originals, vintage rock & roll, and country blues, all delivered in a neoclassic organ trio setting comprised of legendary session drummer Jim Keltner and renowned GRAMMY-winning organist/pianist Larry Goldings. Goldings, featured on piano on “Desert Sun” and “Railroad Bum,” uses the Fats Domino classic “Blueberry Hill” to illustrate why he is considered one of the best Hammond B3 players alive; he delivers a solo that makes you think he’s been waiting his whole life to play this tune. And rock/session legend Jim Keltner’s performances stand out as almost a “Jim Keltner how-to”: propulsive yet laid-back, rocking yet swinging, and rhythmically percussive enough to make you swear there is more than one of him playing. In 2011, Oblon released a Jim Morrison-esque recording of the traditional song “Where Did You Sleep Last Night,” which was featured in last season’s finale of HBO’s hugely popular vampire drama True Blood. He now lives in Nashville where he’s a fast rising guitarist on the session scene. His Tuesday night residency at fooBAR in East Nashville is becoming the buzz event of the week among musicians and those in the know.